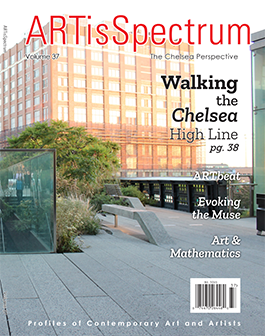 This issue features Chelsea’s High Line, the city’s only elevated public park, where one can experience nature, art and architecture at the center of the art world. This issue also includes important articles on the relationship between art and mathematics, gallery internships, as well as popular features ARTbeat, The Humanitarians and Evoking the Muse. Anyone with a connection to the art world will enjoy the insight that ARTisSpectrum provides. Read on for profiles of contemporary artists, beautiful images, and much more! The cover of this issue gives a glimpse into Thursday night, reception night, in Chelsea, and the excitement and celebration that is felt throughout the evening by art collectors and enthusiasts alike. This issue also includes a special look at art fairs, self-promotion tips for artists, and popular features The Humanitarians and ARTbeat. Anyone with a connection to the art world will enjoy the insight that ARTisSpectrum provides. Read on for profiles of important contemporary artists, beautiful images, and much more! This issue also offers an informative guide to buying art, the popular Evoking the Muse, in which artists discuss the impact of New York on their career and their work, and ARTbeat, in which artists share the arty secrets of their cities. 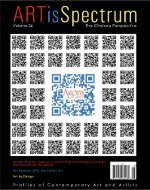 Anyone with a connection to the art world will enjoy the insight that ARTisSpectrum provides. Read on for profiles of important contemporary artists, beautiful images, and more. The cover story of this issue features the corporate art collection of Stephen Schwartz, CEO, Criterion Management LLC. As this article shows, artwork humanizes a business and provides a stimulating work environment for employees and clients alike. 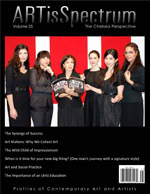 Another article in this issue further details the function of artwork in the workplace. This issue also includes a feature about the contemporary impulse to include street art within gallery spaces, and the recurring feature Evoking the Muse, in which artists represented by Agora Gallery share their experiences of how New York City has inspired them artistically. Read on for profiles of important contemporary artists, beautiful images, and more. 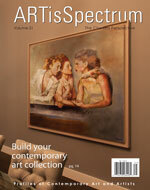 We hope you enjoy the 33rd issue of Agora Gallery’s contemporary fine art magazine ARTisSpectrum. This issue’s cover story details the importance of social media and how contemporary artists can use this tool to further their careers. As the world becomes more connected through the rise of social media, artists are increasingly able to market and promote themselves through Facebook, Instagram, and Twitter, to name just a few. 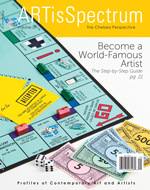 This issue also includes an article about the nuances of selling and marketing non-painting art, a walking tour of public art in New York City, and the recurring feature Evoking the Muse, in which artists represented by Agora Gallery share their experiences of how New York City has inspired them artistically. Read on for profiles of important contemporary artists, beautiful images, and more. 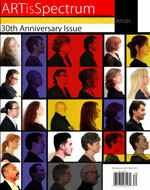 Agora Gallery is thrilled to share the 32nd volume of ARTisSpectrum magazine. 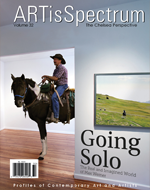 Agora’s own Max Werner – painter, realist, surrealist and cowboy – was inspiration for the cover and feature article. This issue also explores the therapeutic benefits of art, and travels with Angelique Droessaert to discover Renoir. In addition, the popular Evoking the Muse, in which artists discuss the impact of New York on their career and their work, and ARTbeat, in which artists share the arty secrets of their cities, are also featured. 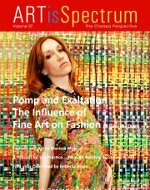 Anyone with a connection to the art world will enjoy the insight that ARTisSpectrum provides. 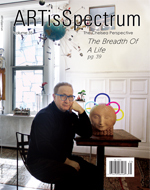 Agora Gallery is pleased to present the 31st volume of ARTisSpectrum, our popular contemporary art magazine. The cover and feature article shed light on how to build a meaningful art collection, highlighting the acquisitions of Joel Feliciano and his wife Diane Fernandez, who have built their collection based on the premise of acquiring artworks with which they feel a personal connection. This issue also contains articles including: a look at studio spaces by photographer Jim Irwin, discussions of painting en plein air by Susan Marx and Steven Hill, reflections on Agora opening receptions by Kristina Garon, memorable art receptions from around the world, and much more. The 30th Anniversary issue of ARTisSpectrum, Agora Gallery’s popular contemporary art magazine, celebrates artistic talent from around the world. The cover and feature article salutes the painters, sculptors and photographers who relentlessly aspire to be challenged, inspire others and grow to reach greater levels of perfection. This special issue also contains other articles of interest including: an in-depth look into Banksy’s month-long street art residency in New York City, art trends in New Zealand, an artist-in-residence experience at Matisse’s villa, insight into the ways that different art collectors choose the piece they buy and much more. In Volume 29 of ARTisSpectrum, Agora Gallery’s contemporary fine art magazine, readers will find profiles of exciting and inspiring artists from around the world. Collectors and art enthusiasts will appreciate this opportunity to take a look at developing talent. The cover article looks at the many ways into the art world and examines the tactics and trends that are valuable for those seeking to enter it professionally, while other articles provide further useful advice and insight regarding the fine art world. The magazine also boasts a distinctively New York flavor, introducing readers to the public art around NYC, considering fashion advice for Chelsea reception nights, and taking a look at the ways in which the city has inspired artists who have visited. Volume 28 of Agora Gallery’s contemporary fine art magazine, ARTisSpectrum, features profiles of exciting international artists, making it the perfect resource for art enthusiasts and collectors to keep an eye on developing talent. 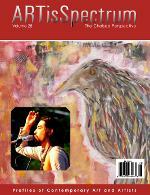 The cover article examines the close relationship between music and visual art, including an interview with well-known musician Jackie Greene. This theme continues in Art and the Arts, which focuses on visual artists who also work in theater, music, stage design and more. One piece looks at U.S. arts funding, while another highlights artists using their skills to help others. There’s also a distinctively New York feel, looking at the impact of an NYC exhibition on an artist’s career and considering Chelsea reception nights. 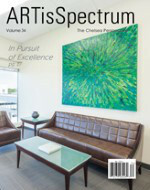 Volume 27 of contemporary art magazine ARTisSpectrum features profiles of accomplished international artists, allowing art enthusiasts and collectors to keep an eye on developing talent. The cover article examines the close relationship between fashion and visual art in its many forms, a theme which is continued in a further article that focuses on the ways three different artists have used their work as inspiration for exploring their interest in fashion. Readers can also be introduced to the concept of pyrography, art which uses fire and heat as its medium, and to the idea of art as a form of nonverbal communication. In addition there is an inspirational piece reminding artists on the importance of finding their own path in life and art, as well as much more. 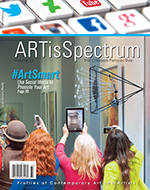 Volume 26 of contemporary art magazine ARTisSpectrum features profiles of accomplished international artists, allowing art enthusiasts and collectors to keep an eye on developing talent. The cover article takes a look at the way new technologies like Augmented Reality and QR codes are influencing art and the way we see the world. Readers can also hear about one artist who works in a studio used by three generations of her family, learn how painting trips could contribute to their work and consider the similarities between ancient cave art and modern art today. You can discover how designers incorporate artworks in their projects and the ways that different collectors choose the piece they buy, as well as much more. 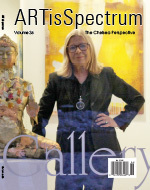 Volume 25 of contemporary art magazine ARTisSpectrum features profiles of accomplished international artists, allowing art enthusiasts and collectors to keep an eye on developing talent. The cover article presents Lynda Pogue’s vision of life at Agora Gallery; this inspiring and multi-faceted artist was struck by the remarkable synergy between staff. Readers can learn about new art trend Social Practice art, the nature of art education and how Cubism has influenced modern art. In other articles, artists can learn how to use video to promote their work, hear other artists’ impressions of New York, and discover what characterizes the art community in cities around the globe, as well as much more. 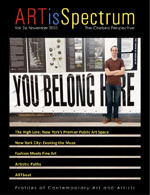 Volume 24 of ARTisSpectrum includes a reflection on the public art of the High Line and what it says about Chelsea, a piece on one artist’s take on fashion meeting fine art, a look at how Japanese art has changed in the last century, and Art Beat, in which a number of Agora Gallery’s talented artists give us a peek into what makes their city special when it comes to art. In addition it reviews the work of a diverse range of emerging and established artists from aroud the world.